The Manipur Government will prepare ranking of all the banks operating in the State on the basis of the services provided by them to the needy people of the State. 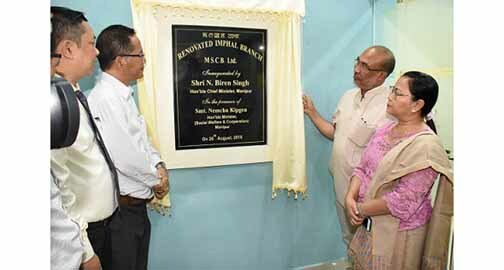 Informing this while speaking at the inaugural function of the newly-renovated building of Imphal Branch of Manipur State Co-operative Bank (MSCB) Ltd in Imphal on Sunday, Manipur Chief Minister Nongthombam Biren Singh said a circular would be issued to ask the banks to submit the details of the services provided to the public soon in this regard. The CM also said it is really encouraging to know that the bank (MSCB) has so far provided loan of around Rs 9 crore to different individuals and organisations who approached him for financial support on Meeyamgi Numit (People’s Day) and Hill Leaders’ Day. In her speech, Social Welfare Minister and Co-operation Minister Nemcha Kipgen, who presided over the inaugural function, said that with an aim for development of Primary Agricultural Credit Societies as multi-purpose self-reliant entities, allied sector cooperatives, and viable functional linkages among cooperatives, the State Government has decided to launch six Integrated Cooperative Development Projects (ICDPs) in six districts – Kangpokpi, Ukhrul and Tamenglong in the hills and Imphal East, Imphal West, and Jiribam in the valley. Under these six proposed ICDPs, it is expected to benefit 2,700 societies by promoting various economic activities through cooperatives in the sphere of agriculture, agro-based industries, cottage and household industries and agro-allied sector like fishery, dairy, handloom, horticulture, rural industries in the six selected districts, added Kipgen. The condition of MSCB a few years back was very disturbing and even there were danger on the survival of the bank on account of high level of non-performing assets/poor rate of recovery of loans due to the non-repayment of loans by the loanees to the bank. Managing director A Subhas Singh of MSCB Ltd also spoke on the occasion.